When my friend Irene found out I was going all-vegetarian for one week, she immediately emailed me this awesome blog full of meatless recipes. Hoping to challenge my tastebuds a little rather than veggie pizzas or black bean burgers, I found this recipe for “Polenta with Swiss Chard and Garlic.” It looked delicious! But, I don’t really know how to make polenta, so I decided to substitute grits instead. It turned up so wonderfully, specifically since I could make a portion for one with no leftovers. Make the grits any way you usually make them… I did not use quick-grits though because they aren’t as smooth. Meanwhile, wash the chard, remove the stems (I accidentally left one, and ick! Bitter! ), and roughly chop the leaves. Thinly slice the onion, and cut the three garlic cloves into slivers. In a large skillet, heat some olive oil (around 2 tablespoons). Add the onion and sauté until translucent, around 5 minutes. Then add the garlic and sauté for about 1 minute. Add the chard and stir to combine. Cover the pan and sauté until the greens are dark and soft, around 5 to 7 minutes. Remove the cover and let the liquid evaporate for 2 to 3 minutes. Remove from heat and add salt and pepper to taste (be careful not to add too much salt at this point!). In another skillet, heat a bit of olive oil and fry the eggs. 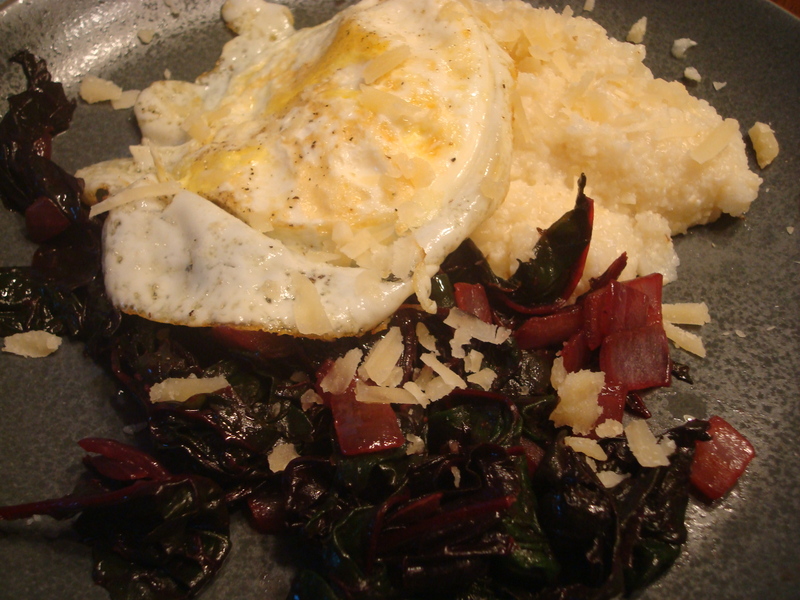 To serve, place a scoop of grits in a bowl, top with greens and egg. Sprinkle with cheese, salt and pepper.